Truly a pastor’s dream is to have a unified team working alongside him to expand the kingdom of God. However, many will attest that it is easier imagined than attained. Just as the frustration to reach team mentality is experienced in corporations it also penetrates churches. Yet, teamwork remains crucial because no matter how great the vision a lack of oneness can hamper if not abort it. Take a journey on building a team—God’s way. 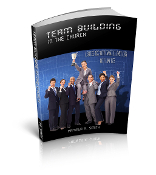 This training manual walks you through the Bible examining biblical teams. It scripturally guides you in laying a solid foundation conducive to teamwork and to flowing as a team. A book that every member can glean from and one that every pastor will want to put in all members' hands. Excellent for Bible Study, Small Groups, or Sunday School. Provides you with weeks of lessons that will strengthen the unity within your church. Review questions at the end of each chapter and other questions and scenarios throughout the book.